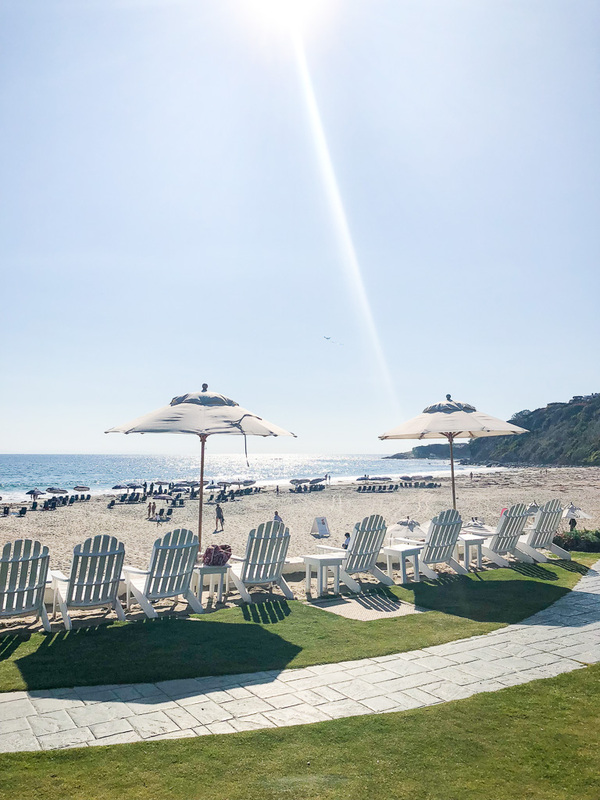 We love Fourth of July and always make a point to explore new resorts and experiences each year. 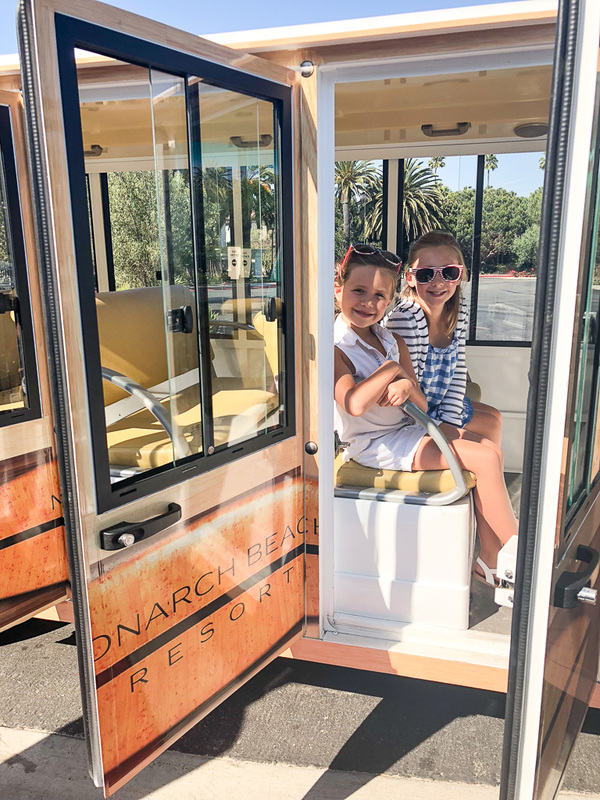 This year we tried Monarch Beach Resort having heard such fun things about their Fourth of July festivities. We checked in on the 3rd and bee lined it for the beach. Beach access is by jumping on a cute little trolley that winds you through the resort to the beach. They have the sweetest set up including loungers, anoraks and The Monarch Bay Club with yummy cocktails and local menu. I had big plans of parking my booty under an umbrella with a glass of rose, but the girls were ready to party. After getting properly sandy, I snuck away to the spa for a facial. To say I was giddy was a massive understatement!!!! I was welcomed with a Detoxifying Ginger Elixir shot made with lemon and ginger juice, black pepper and raw honey. To follow the ginger shot, I sipped a Soothing Green Elixir made from celery, cucumber, pineapple, apple and kale juice. So refreshing! The Miraval Spa is pretty legit! With full service treatments including Diamond facials and Hydrafacials, massages , yoga and endless fitness classes. It even has a DryBar to keep your tresses looking perfect! I had a Hydrafacial and it was the dreamiest! I would say one of the most luxurious facial experiences I have ever had! My skin was left decongested and glowing and the scalp massage was beyond divine! The next day was the fourth and we hit the ground running with pool time! What I loved about the resort is how easy access everything is from morning coffee and healthy snacks at the Part & Parcel market to super attentive pool staff. This mama was so happy! The girls right away made some new friends. 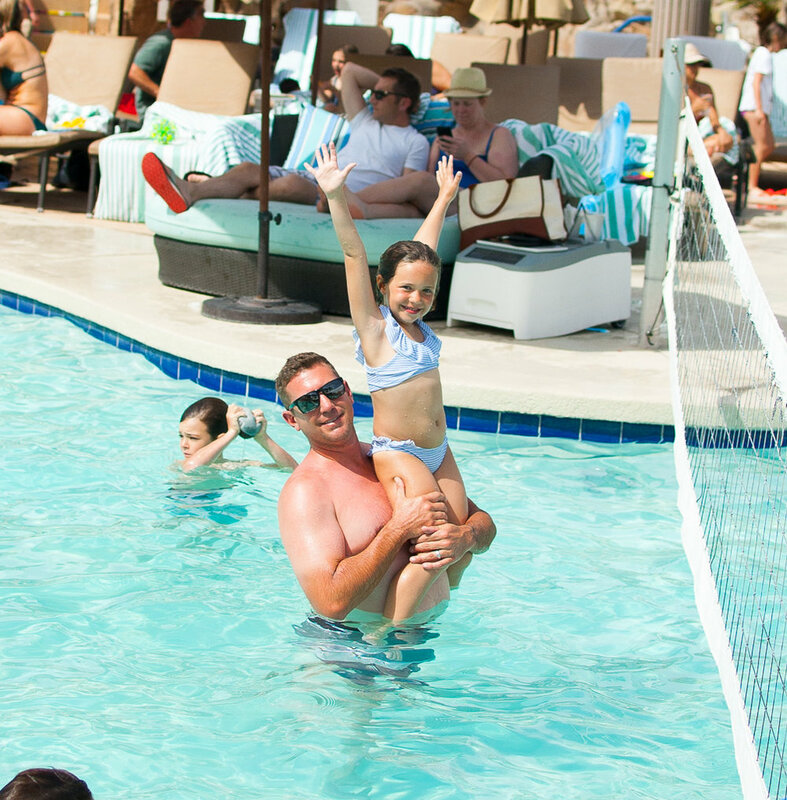 We split our time with festive waterslides, snow cones, the pool and endless fun in the kids club. They got crafty with USA Sand art and Patriotic glitter tattoos. That evening we got ourselves cleaned up for a magic show. The kids were mesmerized! After our minds were blown with the magic, we headed up to enjoy a massive, delicious Fourth of July BBQ buffet and fireworks show! There is nothing like sitting under the stars with your people watching fireworks. My heart is so full watching the girl's faces as the fireworks explode. The next morning, my mom and I tired Aerial Yoga. We were both a little intimidated but have always wanted to try it. How bad could we be right?! We had the best time! The funny thing was that we surprised ourselves with what we could do. 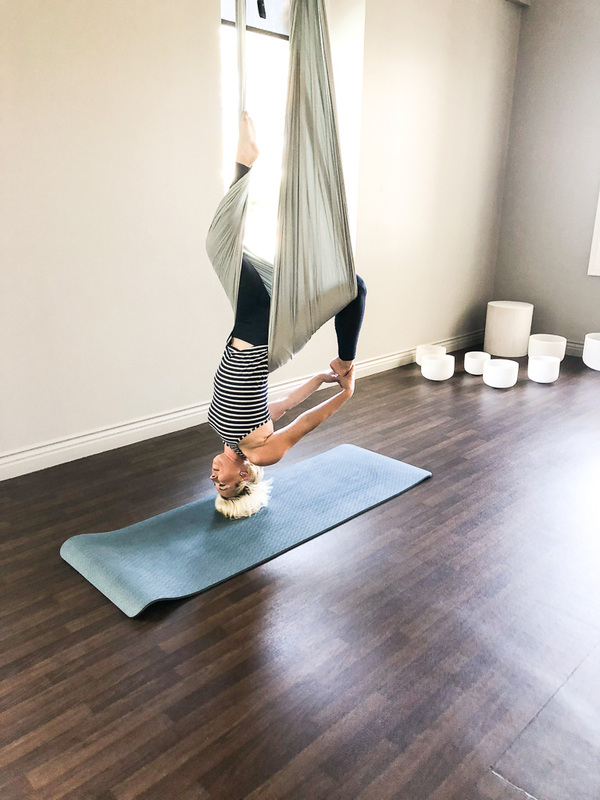 Everything is very mind over matter and once we got over the little fear that came we were able to conquer a couple really cool poses and stretches. There was even a handstand involved. So to say we are submitting our applications to Cirque de Solei....game on! Overall, we had the best trip! The hotel is beautifully styled, has impeccable service, yummy food and a million activities to keep all ages busy and excited! We will definitely be back! Reason 1. No one wants you fogging up the glass during class while your daughter is dancing. Disclaimer on this one... I did ask Capri if she wanted me to watch her practices and she said yes. My intensity level was apparently accepted. Reason 2. No one wants you, as a grown woman, doing the Jr. Jazz routine almost full out in your chair. Reason 3. Calm down, the pirroute prep situation is giving you a major eye twitch. Can she just turn the correct way? Don't even get me started on Peyton's turnout! Reason 4. My panic ensues when we are off count. Reason 5. Can we just let it be fun and not be about being the best? I'm not sure on how to even deal with that basic question. Reason 6. Capri forgot half of her 2 routines in her first show. I broke out into a cold sweat. Reason 7. There was a mother/daughter dance at her show. Should I even tip my toe into that situation? It took every restraint to not bust a serious move. I thought about it but for sure knew I'd rip my hammy so that settled that. So overall, I'm trying to be a good dance mom. It's taking a very large effort and I'm working really hard on making sure the girls aren't aware of my level of crazy. What I can say is we are pretty situated in our stage hair and makeup game. #wegotthis Parenting is no joke! Any other dance moms feel me? Palm Springs is always our favorite go to when it comes to spring break. We love that if feels like a real getaway but is still close to home. We stayed at the Westin Mission Hills this year and were so excited to explore. First off, we made a b-line for the pool! It was a mad house but we hit the water like no one's business. I booked this resort solely for it's waterslide to be honest. The girls swam for about 3 hours and took turns on the waterslide a million times. We had a hankering for Mexican food and drove a couple blocks for some yummy tacos and chips. We decided to tuck in early that night and continue our Star Wars marathon we had started earlier in the week. Us girls had never seen Star Wars so Erik thought it would be fun to watch all of them over the break. Day Two, we hit the pool super early. This pool seating situation was no joke. I set my alarm and off we went at 7:45 for our spots. Once our mission was accomplished, we grabbed a nice easy breakfast at the Mission Hills Market Cafe. I love the ease of this sort of breakfast. They offered fresh pastries and Starbucks coffee along with toiletries and snacks for the rest of the day. Cereal for the girls and coffee for mommy and we were set. We also had the option of fresh pancakes by the pool too which smelled delish. That was definately a perk of getting to the pool early was yummy breakfast options and quiet pool. The Westin hosted super fun kids activities all throughout the day. 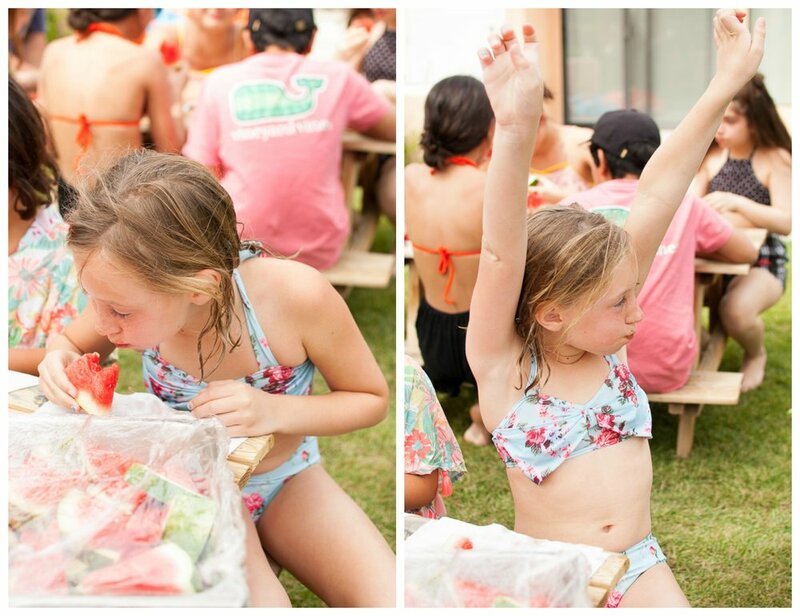 From family fishing to waterslide lifeguard games to watermelon eating contests there was always something fun to do. Capri decided to participate in the watermelon eating and won! Girl can take a watermelon down! That night we ordered Dilberts pizza in for more Star Wars. They were playing a fun movie that night by the pool but we were all sun kissed and exhasted from the pool all day. Day Three greeted us again with a simple cafe breakfast and comfy spot at the pool first thing. My idea of a vacation is parking myself by the water and absorbing myself in a book all day. I got my wish! I literally barely moved and was so happy about it! For lunch the girls noshed on freshly grilled burgers and mommy got a fresh watermelon salad while Erik hit the gym. The girls swam all day and when we had our fill, we hit the road reluctantly. - Get to the pool no later than 7:55 am to get a spot. 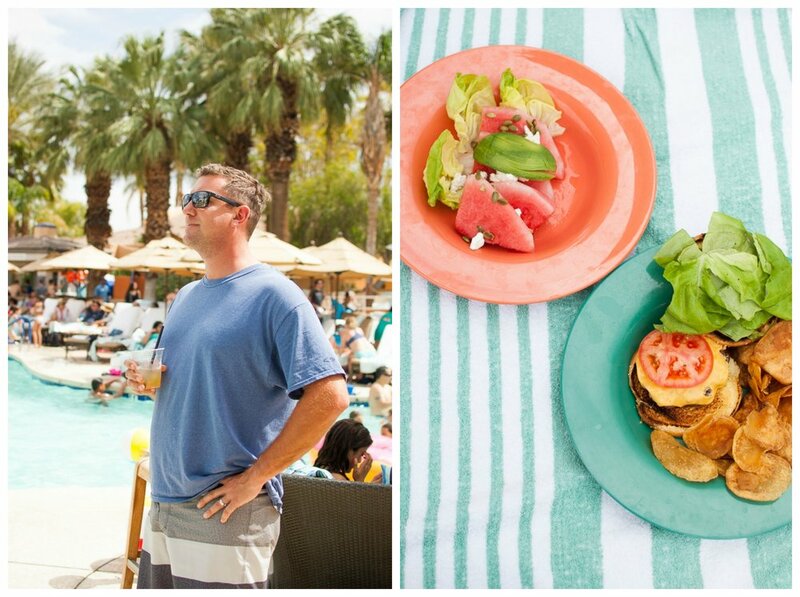 -Take advantage of poolside breakfast and cafe. They will save you money and time getting a whole family breakfast situation at a restaurant. -Plan to keep an eye on little ones, the pool does not have lifeguards. -Take advantage of the kids activities and kids club for a nice adult free couple hours. -Bring fun pool floats and balls. There are a million kiddos around and the floats were a hit. The pool also has a volleyball net to play with. Overall, another great family Spring break vacation for the books. I had a funny conversation with a friend the other day about what was on my agenda for my "average Momprenuer" Monday. I was saying how relaxed the day was going to be and then got to really thinking what my "normal" Monday would be. Momprenuer life is no joke! Mom's wear many hats and then add in work life the hats double and triple. I am so fortunate to have a couple businesses that allow me most of the time to work from home. Nevertheless, my days are run like a well oiled machine. Not every day is the same but here is my Monday from this week. Don't miss the big GIVEAWAY at the end of this post!!! It's a good one!!! Let's get into it! 7:00 am I rustle up throw on my robe over my pjs and get to the morning routine. Yes, I am 100% the mom that rocks her robe to school drop off! Peyton is not a morning kid and loves to be cozy so she takes quite a while to get rolling. Capri is much more like me and once we are up , we are up. We check the weather and quickly decide what to wear that day. As the girls wake up and get dressed, I start breakfast. Our hens are giving us so many eggs so mornings consist of scrambled eggs, berries and english muffin. As the girls eat, we listen to some music and I work on lunches. Lunches consist of half a sandwich ( peanut butter only for Capri and peanut butter and jelly for Peyton- Don't mix them up mommy!!) a piece of fruit like a cutie orange and a healthy chip or pretzel with juice. Snacks get packaged and put into backpacks while the girls grab their vitamins and start working on brushing their hair. Hair done, teeth brushed, shoes on and off we go! 7:40 am Off to school. We love to listen to music and chat on the way to school. I really try and make mornings fun so it starts our day off great! 9:00 am 2 cups of coffee and email checking begins while one load of laundry gets started. 9:30 am I make a couple protein pancakes or eggs and get to responding to my emails, making grocery lists for the day, list of things I need to accomplish that day ie. change sheets, pay bills, clean bathrooms, workout, bleach teeth, shower etc. 10:30 am Workout for the day ( quick Tone it Up workout or a class) and beauty maintainence. This would be doing some self tanner, giving myself a mani pedi, face mask or teeth bleaching. This may seem silly but being a blogger and work in the wedding industry it's important for me to keep my self situated. Nails are in my bride's wedding photos and in my blog photos. We randomly need to shoot a look or something quick for the blog so self tanner helps me not look scary. Teeth bleaching was on my 2018 goal list. I partnered this year I partnered with Smile Brilliant and have the prettiest teeth I've ever had. I've used white strips in the past and would be so frustrated with them sliding around and missing the stains on my gum line not to mention ouch to my sore gums. Smile Brilliant bleaching trays have been a game changer! I got customized trays that fit my teeth perfectly, bleaching gels and even desensitizing gel to keep my gums happy. I pop in my trays and get on without a hitch in my to do list. I can tackle phone calls without sounding funny, do a workout, take a shower or even run an errand and they are virtually undetectable. I brush my teeth to get my morning coffee off, pop on my trays with bleaching gel in for 30 minutes. Brush with wet ,sans toothpaste and follow with desensitizing gel for 20-30 min. I rinse and viola! I pop in my trays and get on without a hitch in my to do list. I can tackle phone calls without sounding funny, do a workout, take a shower or even run an errand and they are virtually undetectable. 11:30 am possibly shower and back to computer. This time I follow up on morning emails and start working on timelines for upcoming bride trial runs and weddings. Next, emails go out to my team to keep them up to speed on upcoming appointments or weddings. This is my time for brainstorming on new blog posts and/or shooting them and online shopping for items for upcoming posts or trips. 12:30 pm out of the house chores. This Monday,I dropped my car off at car wash and walked over to Target to get a competition team little present for Capri's competition team sister, more La Croix ( obviously) and trash bags. Next was grocery store for week's worth of groceries and Erik's meal prep items. 3:00 pm I prep a snack for the girls while they relax and start getting homework out. We like crackers, celery and peanut butter, apples or pretzels and quac or hummus. Snack plates and fruit bowls are big favorites. 3:15 pm Homework for both girls while I go through their school folders to see what's up for the week from their teachers. 4:30 pm Capri gets ballet gear on and hair up in bun and off we go do dance for the night. Monday's dance schedule consists of Ballet and Lyrical for her. 5:15 pm Peyton finishes up homework or works on some chores while I start dinner. Tonight we are having spaghetti. Ground turkey, yummy Rao's sauce, whole wheat noodles for girls and zoodles for me and Erik. After dinner is ready Peyton and I play a game or watch a movie together. 7:00 pm We pick up Capri from dance and daddy gets home from work. 7:30 pm We gather at the table for dinner ( non-negotiable) and chat about our days. We have our routine of "Best Day" we each take a turn discussing the best part about our day. This could be something awesome that happened that day or something simple like the pretty weather or great song we heard. It gets us all talking and connected. I'm a big believer in family dinners and lots of conversation at the table. 8:00 pm Girl's jump in shower, brush teeth, brush their hair and night time books picked out for reading. Hugs and kisses and na night time. 10:30 pm Lights out for mommy! Every day is different and I keep a tight eye on my schedule for the week to make sure to stay ahead of any things that may need prepping. Girl Scout badges needing sewing, school party treats, new dance tights etc etc etc. In honor of all you busy working mamas, I've partnered with Smile Brilliant to giveaway $149 credit towards your own Smile Brilliant bleaching kit and 15% to all my readers using the code below! I asked you guys last week on Insta Stories what your Easter basket go to's are and got so many awesome ideas! I am avoiding candy or sweet treats and wanted to keep the whole thing simple. My girls get little treasures all year with a new movie or a Disney day so all the gifting doesn't feel super necessary to me. But who doesn't love a sweet Easter basket?! We got so many great ideas from swim suits, coloring books to bubbles and chalk. 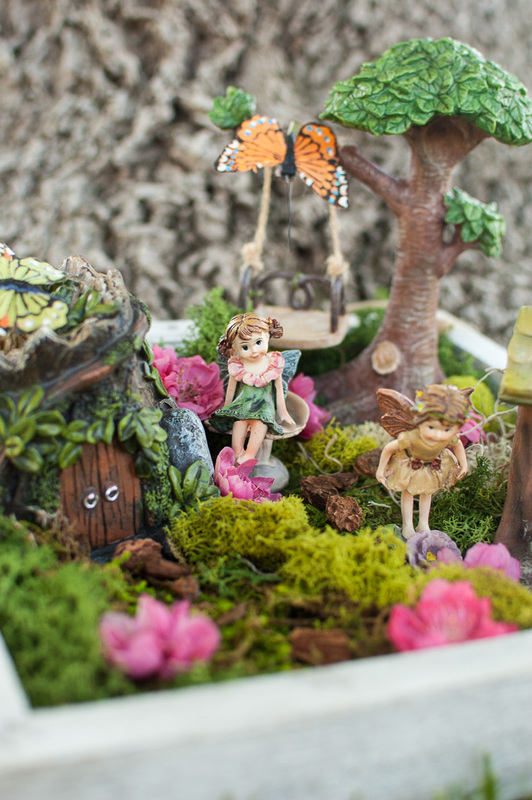 My most favorite one was additions to our fairy garden! 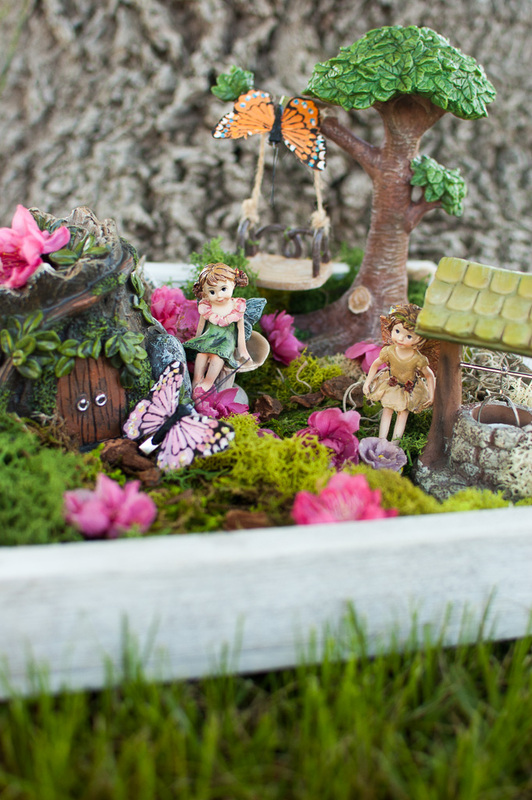 We have a special spot in our yard we planted last year that houses our fairy garden and I can't wait to add precious little additions to it. 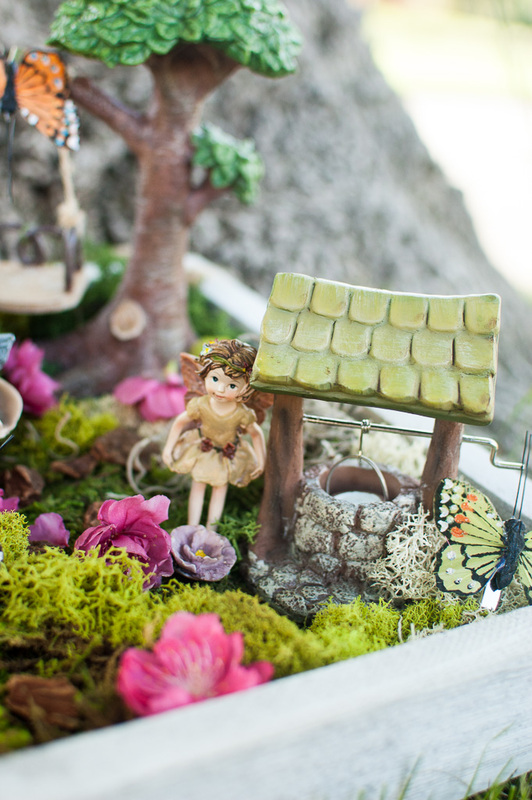 We now have two new fairy residents of our precious little spot. Their home is complete with tree swing, bark path and wishing well. I had so much fun creating this sweet little land and adding blooms from our peach tree for a little extra. I have gotten so excited about all the fun treasures and created a whole Pinterest board dedicated to all the magical things people have created for their gardens. If you are a "Classic Christmas" fan and love all things green and red for Christmas you may lean towards this timeliness option for your pics. We did a play on this look last year amongst the trees and it turned out so festive. You could also shoot this look next to your Christmas tree at home. Tip: Don't be afraid to introduce sequins and navy blue into your classic feel. Navy adds some dimension to the traditional red and green and there is nothing more Christmassy than sparkle! Our 2015 Christmas pictures ore my favorite to date! We were barefoot and casual. These pics turned out so dreamy! I wore a flowy navy blue dress which caught the slight breeze perfectly. The girls wore soft cream dresses and Peyton topped hers with a faux fur vest. The added texture and color was unexpected but just right. I loved our clean pallet that just lent itself perfectly to the coast. Tip: Mix and mingle textures in neutral colors for beach shoots. I always aim for coastal colors when shooting at the beach. Think creams, tan and blues for the perfect soft pallet. Bright hues tend to detract from the gorgeous coastline. You want to pop against the waves but organically so. Think crackling fire, snow covered trees and snuggles! This theme is so fun and totally casual! Go all out with your plaids, beanies, vests and fur! All of it works! Tip: Classic red and greens are super festive for this sort of theme. I like to play the outside of the obvious choice and go with neutrals and deep jewel tones. Layer colors and fabrics to create something interesting and different. September is in full swing and we are plotting our Fall bucket list. I love apple picking and last week we had perfect weather for it! We were a little early in the season but still had a great time! We are lucky to be so close to apple country and love the sweet country feel of the area. Our favorite Riley's farm was closed , so we visited Riley's Apple Farm to pick our apples. We had such a great lazy day. The girls found some fun activities. Capri decided she was very into archery. Little Peyton was to young but was just as happy to watch. After our Merida moment we went on the hunt for apple pie. We ventured up the hill further to Los Rios farm and picked up a slice of apple pie. The fresh air, bbq smells and families frolicking on the large grass lawn made for the perfect kick off to Fall. We have heard nothing but daunting claims that 3rd grade is the most challenging academically. Man, I thought 1st and 2nd gave me a run for my money with my not so studious big girl. She comes by it honestly though. The academic part of school was not my specialty. Ha! I had the social part down though! Learning new skills still are hard for me. I have to work really hard to master something and Algebra was never one of those things. We are supposed to tackle multiplication, division, long addition and subtraction and ALGEBRA! What the heck!! I was planning on doing some tutoring with both girls this summer to hopefully get a head but we are into August and mostly have been just partying! I decided that since all I've done is work on the fashion part of school next year, I should probably get going on this "getting ahead biz". Math is her biggest struggle. I called a couple local tutoring centers and they were all so pricey! I thought maybe I would skip a formal atmosphere and get them something online that they would think is fun. Challenge accepted. We do Jiji math at their school but I wanted to try something not as familiar for them to hopefully keep it fresh. We landed on Splash Math and it seems to be going well. They start with an assessment and then we move on slowly through the different lessons to really hit all angles of the new skill. Both girls seem to be enjoying it and most of the time they are able to get the hang of it themselves. So far so good! Today was filled with church and solid delirium for both the girls. They were so giggly and looney! This makes me nuts!!!!! I love the giggles but the loon nonsense makes me crazy! They just start getting ornery and stop listening. We have been staying up really late and I've decided it might be time to start inching towards our normal bedtime to avoid days like today. The day ended nicely thoug. I fired up my Chris Tomlin worship music and sent them outside to jump on the trampoline for 4 hours. Work that energy out while mommy get's rid of her crazy eyes. Next thing that I can't understand is the sheer amount of food my family eats during summer! Any other mamas find this to be a struggle to keep up with? I'm talking meals and snack plates every hour! I really try my best to feed my family fresh and organic. I know this isn't for everyone but it's really important to me and something I try to stick to. We have a great produce stand around the corner from us that I make weekly trips to stock up on all of our fruits and veggies. I recently tried Butcher Box for our meats and we gather fresh eggs from our hens daily. My girls are super picky as I mentioned last week in my Mommy Monday post and my hubby is pretty picky too. I'll eat anything so I'm super easy I think! Erik is a big guy so to feed him is literally 3 servings of our dinner or meal.He likes what we have coined "goulash" meals. That means basically anything that looks like a casserole and is all wet and mushy together. He also is trying to keep the lbs. off so he wants me to make healthy " goulash" . What?! He loves mexican food, won't eat fish, no pork, minimal fruit and some veggies. Okay, good luck to me! My struggle is not spending an million dollars a week on feeding everyone. How does anyone else battle this? I think it may be time to get back to Costco trips! Lastly, I had such a happy mommy heart this week with my whole gang together. If you have followed for a while you know my hubby is a police officer. We don't see him as much as we would like to. When he is home our time together as a unit is gold! He took the kids with him running errands the other day and came back with two games. They picked up LIFE and Battleship. We decided on LIFE first. We got our snacks all ready and gathered around our sweet new breakfast nook table to play. We giggled and played together for about an hour. Man do I love my little group. Time like that is so priceless and makes my heart so full. I finally finished Capri's gallery wall! I have had this artwork for months now and have been dragging my feet on completely the project. Well, this past week was the week! I knew I wanted an eclectic yet polished feel for the wall. The gallery was being done above her day bed on a large wall. I had super cute artwork with a coastal, fun feel. I found this adorable striped umbrella print and this ocean wave illustration to kick me off in the right direction. I consulted Framebridge to help me with the layout and some design ideas. They have this great design program for $100 that you can send them the sizing of your art and they will design a couple layout and frame options for your wall. This also includes the hanging measurements of each piece too on your wall. I love it! Sort of everything I needed. You can of course choose from their huge variety of frame options or take the basic idea and replicate the look on your own. I did decide to take full advantage of a frame sale going on a Michaels and get some similar frames to those Framebridge picked out for me. I just adore how it all came together. Our sweet little peanut Peyton turns 6 this week! Can't believe how time has flown! There is nothing sweeter than this little girl! We celebrated with a handful of her school friends in our backyard. The party was super simple and just as she wanted it. We did a Moana theme with the cheesiest of Party City party supplies. We ordered pizza and sang happy birthday with an ice-cream cake! Do birthdays get any better? I have been having so much fun working on the girls rooms. They are both so different that it's been fun to ask them what they like and work in sweet accents that make their own spaces feel special. I have a hard time focusing on more than one room at a time and getting the vision all together so I started tackling Capri's room first. Capri turned 8 this January and I wanted to make sure her room felt like a big girl and had lots of room to grow with her. She is full of life and energy so I wanted her room to feel happy to carefree. She loves the beach and bright colors so I aimed for a beach feel that was bright and cheery. My grandma always told me that when decorating your house you should only fill it with things you love. I've been keeping that close to mind while working on these new projects. Here are a couple of the prints and wall art that brought joy right away! The room is coming along so great and I can't wait to share the whole room when we finish it up! For more house renovation projects keep checking back under the or #LifewithLipstickOn on Instagram. Loads of fun stuff coming! If you follow my social media, you know that Santa brought baby chicks this year for the girls! I had been wanting chicks since we moved into the new house since we have some land now yet didn't know when the time was right. We keep a busy schedule and I wanted to make sure I wasn't biting off more than I can chew! Because lets be real, mama is in charge of these chicks until they go outside. I did a lot of research before committing and asked a ton of questions! The poor lady at the feed store should have known when I showed up with over the knee boots on! This place was not for over the knee boots! Anyway, here are some of the questions I had and what we have found out. 1. Which chickens lay the most eggs? Sussex- about 250 brown or creamy white eggs a year. Ancona- about 200 white eggs a year. Buff Orphington- about 180 eggs a year but get " broody" or lay less in the summer. Also there are Easter Eggers or Ameraucana's that lay BLUE eggs! So fun! We want to add one to our roost as well as the ridiculous looking Silkie! 2. Which are the most friendly? A: Our main purpose was raising chicks that were friendly and the girls could treat like pets. We found that Plymouth Rocks, Rhode Island Reds, Buff Orphingtons, Brahmas, and Silkies amongst a couple others are great with kids and can even be trained. 3. How many should we start out with? A: We were recommended 4-6 to start with. We got two Rhode Island Reds and two Plymouth Rocks and plan to add two more to the bunch. We chose these two breeds because that is what was hatched at the moment as well as being friendly and good egg layers. 4. What sort of gear do we need to start with? Water feeder- we got plastic on with shallow dish ( chicks are big dummies and can drown easily so make sure water isn't deep. Electrolyte powder and Probiotic powder- we add this to water. Food feeder- Ours is plastic and has a dispenser with small holes. Again the dummies poop in their food sometimes and its best to not waste a bunch of food. Food- the feed store recommended chick starter which is made of grain and milling. Its super fine and the chicks seem to love it. We will switch most likely to organic as soon as we get into their coop. Shavings- A big bundle of shavings is put at bottom of your nest to keep sanitary and for them to be comfy. 5. How much maintenance do they need? A: Chicks need very little maintenance! I clean the nest and replace the shavings once a week and keep an eye on their water and food. They do have a tendency to poop in their food as well as kick up shavings that land in it. I change their water it seems like about once a day or as needed. Their food dispenses as they eat it and I refill that maybe once a week. They also tend to poop their too so make sure to keep that clean so they don't get sick. 6. What's the coop situation like? A: We are super excited about this Boomer and George coop . As soon as the weather is warmer and the chicks have their adult feathers they can go into their coop. It's recommended to keep coop in shady place and avoid a wind draft. Chickens like a little run so some space is good if you aren't going to keep them free range ( on the loose) all the time. 6 chickens will be just happy in a 4 box coop. They like to be together so some bunk up with another to lay eggs or keep warm. Overall, we are having so much fun with them! They scurry around, eat like piggies, sleep and cheep! Ours are super curious and love shiny things. We have named them Hay Hay, Little Red, Bixby and Flower! We are gearing up like crazy for Christmas in our house and I had so much fun setting up for our annual Christmas movie night! I love giving the girls their Christmas pjs and slippers and we cozy in by the fire for a family movie night to kick off the season. We've done Polar Express before ( see our fun here) and this year we chose the movie Elf so I thought it would be fun to decorate with all things Elf inspired. 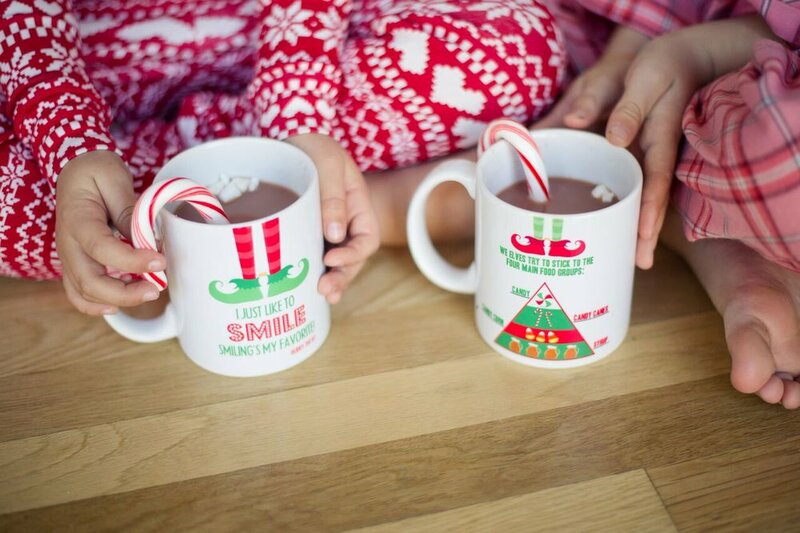 Hot cocoa and candy galore! 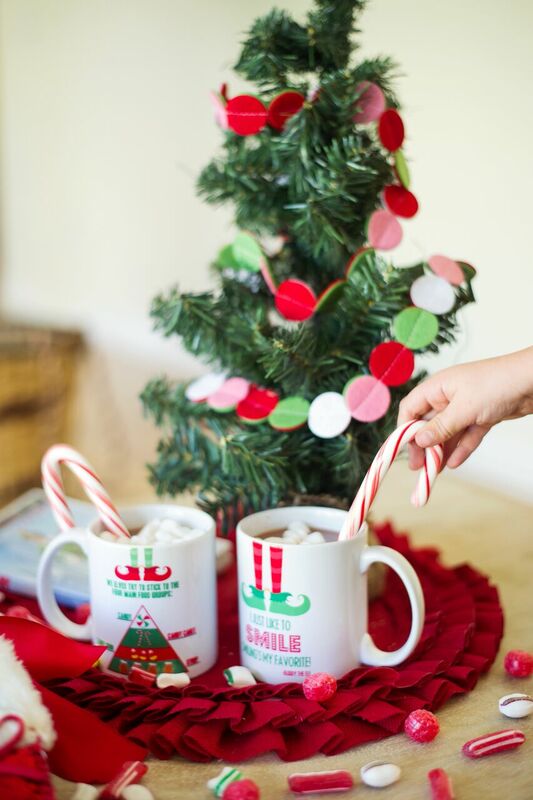 I found the cutest Elf quote mugs and wrapped up their glittery slippers and pjs with bright red ribbons. I adore this tradition! The girls go back to school next week and it's all bitter sweet! We have had a great summer but I can't say I'm ready for a routine again. We are stocking up on our "Back to School" outfit staples and have our closets almost ready for the new year. When planning outfits for back to school, I always aim for a capsule approach. A "capsule" wardrobe is one that each piece is timeless and can be interchanged with the others to create different looks for each season. We aim for comfy dresses and tops that can be layered with cool denim jackets or leggings when the weather chills. I also like to shop for the comfiest of shoes. I a only buy shoes that last and can be worn with a million different outfit combos. 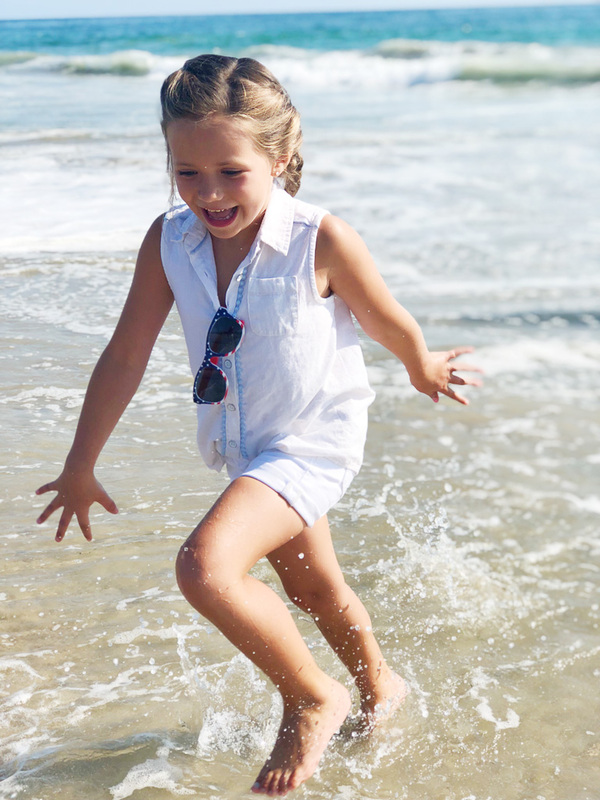 We typically opt for one pair of "running" shoes, one pair of boots that can double as rain boots, and one pair of fashionable shoes like booties.